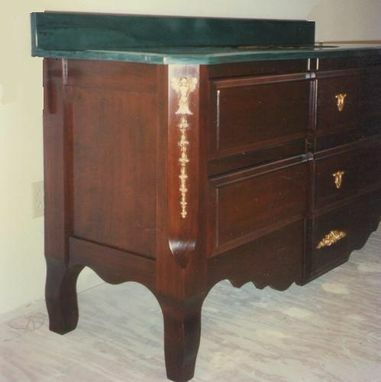 The vanity is constructed of poplar stained a deep mahogany color. 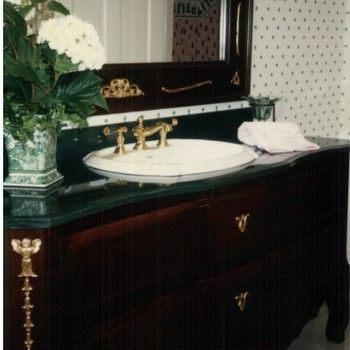 The applied ornaments are gold-leafed to accent the detail. The custom matching mirror frame appears to be bent. However it was designed to fit in an attic bathroom that was remodeled for a young ladies needs. The solid surface top has contoured edges to follow the shape of the vanity.Free-standing legs add extra detail. 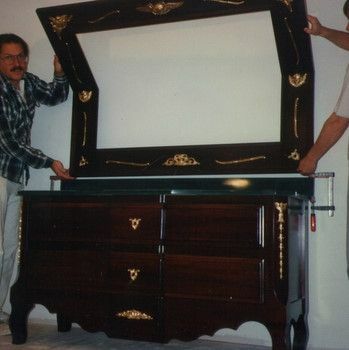 Dimensions: 6' vanity as shown. Custom sizes available.